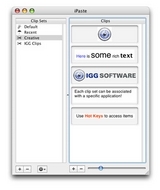 Access clipboard contents via HotKeys. More Apps IGG Software, Inc.
Is iPaste really the best app in System category? Note: On 4 October 2013, IGG Software announced that it was ceasing development of this title. It will continue to provide technical support to its existing customers for one year, but no further changes will be made to the software, nor will it be for sale any longer. Version 1.1.3: Release notes were unavailable when this listing was updated. 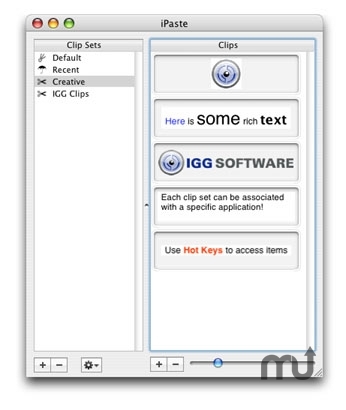 iPaste is a tool to make clippings (e.g. pieces of text, images, PDFs, etc.) that you commonly paste into applications easily accessible via HotKeys and a contextual menu. It is an unobtrusive clipboard manager that has a small footprint so it is forgiving on system resources. No cluttering windows necessary and it can be hidden from the Dock.